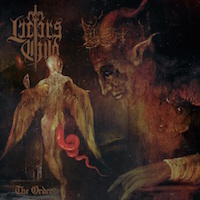 LUCIFER’S CHILD serves the Lightbringer via Live worshiping Summoning and Recorded Rituals. LUCIFER’S CHILD is an unholy creation of George Emmanuel (ROTTING CHRIST, ex­-CHAOSTAR) and Stathis Ridis (NIGHTFALL) based in Athens, Greece and formed in 2013. Their music serves a spiritual introduction to the atmospheric world of wiccan’s summoning. Pulsating the energy of ritualistic lyrics and the horrifying electrism of black music, LCFR create a unity between the sound and the spiritual idea that each creation serves to the listeners. The Recordings of "The Wiccan" record took place in Athens, Greece during summer of 2014 delivering 8 blasphemed seeds at their most horrifying metal sound. In March 2015 were contracted to a Norway based record label called Dark Essence Records, who swore to spread their musical infection worldwide via Compact Disks, Vinyl Records and Digital Downloads. In time, this unholy alliance will communicate you through any of the known media for becoming a LCFR's summoner yourself through Live Rituals and by purchasing sacred objects of Wiccan’s kit. "The Order" was recorded, mixed and mastered in Emmanuel's own recording studio, Pentagram. He commented on the new album: "After three years of converging and sculpting our ideas and sounds we are ready to present our second full-length album entitled “The Order”. Lucifer awaits!". “Viva Morte” has a ferocious impact to start off the album. The beat and all-round melody is penetrating, fast, but very well controlled. From the off the band give their all; Nick on the drums is thumping away with a pulsating rhythm. The skills from George on guitar show different style, not only immense Progressive Black Metal power, but Technical Death Metal bends thrown in to create a complexity and perspective that really stands out. Stathis lays down a thick bass that can pass through any solo. The sound is astounding how it all comes together. Marios holds his own through the song, belting out a magnificent melody of his own, the screams work very well in cohesion with the overall sound. The sound itself has a few Blackened Thrash aspects in the speed and clarity of the instruments, but it is their own sound. “The Order” is a slower, more progressive theme. The pace is steadier, less thrash. The backing chanting helps to create atmosphere. Marios keeps the vocals in short bursts, with remains effective. George picks up pace, taking the guitar into main concentration, the action is controlled greatly with drums and bass flowing fluently in the back, the pace helps to keep the Ritualistic vocals heard and clear. The inaugural of “Fall Of The Rebel Angels” is in keeping with the trash pace once more, adding here more bends from George. The darkness is in tune once more, the chanting of Viva Morte (English: Live Death) are great to control the verses of the song. It is sung with true Satanic passion. Instruments are all, again, on form. The pace and tempo are high, screams are spot on. This is the perfected sound of Modern Black Metal!